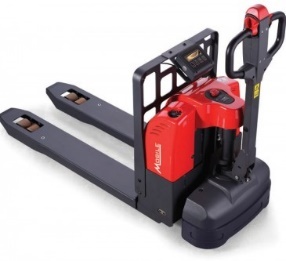 Walkie & Rider Electric Pallet Jack Material Handling Equipment Selections pt. 2 - MOBILE INDUSTRIES INC. :: Material Handling Tranport, Lift and Warehouse Equipment. 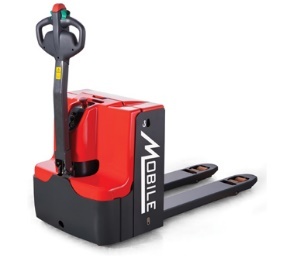 Mobile Industries’ material handling solutions include both walkie and rider electric pallet jack and stacker choices for you as a current and potential material handling dealer partner. Our line of semi and full electric pallet jacks and stackers are built to ensure that your customers maximize performance, improve operational efficiencies and reduce worker fatigue and injury. These units offer the standard manual hand pump operations of lifting and lowering loads while combining the features of a self-propelled electric pallet jack allowing for the operators to transport loads easily and efficiently. The ESET33N provides you and your customers an economical alternative to other, more expensive electric pallet truck models while being suitable for a number of light-duty warehouse or similar applications. For increased operational range and mobility, this model comes with a built-in charger. For more information on Mobile Industries’ solution for your customers, visit our product page for our Powered, Manual Hand Pump Pallet Truck option. Designed to be used on small delivery trucks that operate within cities, the EFET26N is an economical full electric pallet jack that incorporates a manual lowering mechanism to improve precision and careful fork descent. The full powered, self propelled movement adds an ease of transport of your customers’ material handling needs. This compact unit has exceptional performance with its light-design in the back of trucks that are equipped with tailgates and lift-gates with its tight turning radius and high maneuverability. The EFET26N comes with an external charger with the option of being purchased with the recommended, additional battery to ensure that the operator has one battery that is always on charge while the unit is operating. 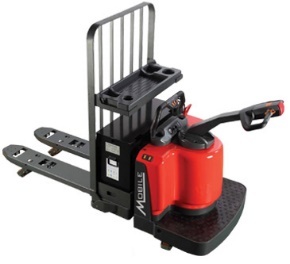 For more information on Mobile Industries’ solution for your customers, visit our product page for our Affordable Electric Pallet Jack option. These fully powered pallet jacks are affordable alternatives to the higher priced fully electric pallet truck models. This line features the powered operation of raising and lowering material handling loads while including a self propelled drive to improve the ease of transporting goods. With its built-in charger, the EFET33N has an increased mobility and operational range. As a battery saver, these units come with a battery discharge indicator that has an automatic cut off of the lift function when not in use. Its light-design and compact build makes it a perfect choice for a number of light-duty warehouse applications in addition to similar environments. For more information on Mobile Industries’ solution for your customers, visit our product page for our Affordable Walkie Powered Pallet Jack option. The EFET33SC offers your customers a material handling equipment solution that keeps their efficiency in mind and will allow them to determine pallet load weights quickly and economically. Your commercial and industrial customers will benefit from their functionality and efficiency. With a built-in weigh scale, our electric pallet jack scale is manufactured to include gross weighing, net weighing, total weight and zero correction. Rather than transferring loads to a platform scale, they can be weighed in transit. With easy-to-read, high-contrast LCD displays, shipping and receiving loads can be verified right on the pallet truck allowing for immediate and easy loading and transport. This is maximum efficiency for your customers. For more information on Mobile Industries’ solution for your customers, visit our product page for our Weight Scale Pallet Trucks option. When it comes to all-around transportation and warehousing applications, the ESPT44WLH line is a top choice. 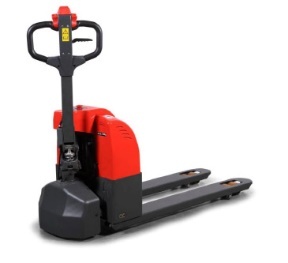 With it’s 4,400lb load capacity and small turning radius of 58.6”, it is particularly exceptional in material handling applications where space is limited. Its long handle design makes it stand out in allowing for better operational control. Operators can safely lift and transport loads from an ergonomically and safe distances and heights. As a fully powered walkie pallet truck, operators can safely transport loads at its laden/unladen travel speed of 3.72mph. This unit has a powerful battery that also includes a sideways battery exchange option. 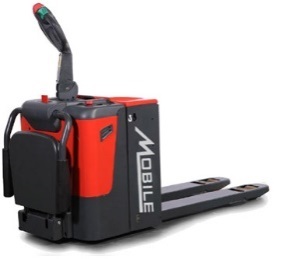 For more information on Mobile Industries’ solution for your customers, visit our product page for our Powered Electric Long Handle Walkie Pallet Truck option. 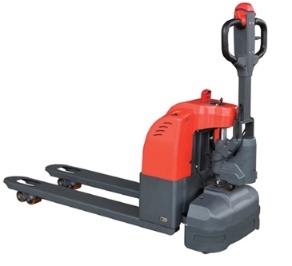 The ESPT44N gives operators the choice between using it as a walkie or a rider pallet truck. This line of powered pallet jacks is specifically designed for material handling, lifting and transporting of heavy-duty loads. The main highlights of the pallet trucks are they are fully electric, self-propelled and high weight capacity. These features benefit the operators in allowing for efficient and safe, long-distance, long handling. For more information on Mobile Industries’ solution for your customers, visit our product page for our Powered Pallet Truck option. As one of our highest capacity pallet jacks, the HESPT60N is able to handle your heavy-load material applications in lifting and transporting loads of up to 6,000lb. These units are fully powered pallet trucks with full electric lifting abilities and fully self-propelled movement. The operator platform allows for maximized efficiency and safe load-handling principally, but not limited to, warehouse applications requiring long-distance transport. For more information on Mobile Industries’ solution for your customers, visit our product page for our Heavy Duty Powered Pallet Truck option.